What a space saver! Change your perception of practicality with our contemporary Delilah Stacking Chairs. The Delilah Stacking Chair’s adaptable seat works well in the dining room, kitchen or home office. The deeply curved back provides excellent comfort to your lumbar area and is detailed with intricate leaf-like holed pattern in seat. The Delilah Stacking Chair easily stacks when not in use. No matter what you choose to use it for, this multi-use chair will bring out the best in your event. can't wait to show these off come spring time!! I am SO EXCITED to bust these out come spring time!! They easily fit in my storage space without taking up too much room - a FANTASTIC FIND!! 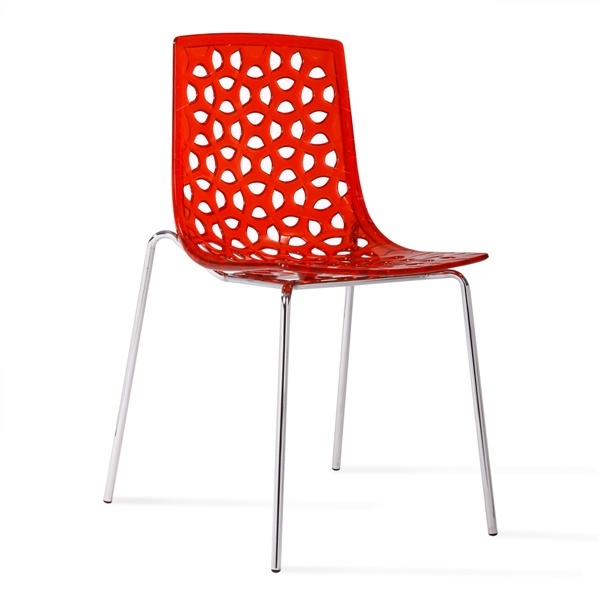 Gel-like translucent look has such a pop modern feel to it, i love my new chairs! eye-catching color! spruced up the place! The cherry red color really pops compared to the rest of my furniture, i love it! Turns out a splash of color here and there is exactly what my place needed, thank you! convenient, vibrant color, good quality, awesome for extra company! cut-out is so chic and i love the colors! Beautiful design and comfortable too! Really interesting design! I love the cut-out look and vibrant colors... These are perfect for when guests come over! Thank you! Is there a weight limit on these chairs? Thank you for your interest in the Delilah Stacking Chair from Inmod! The weight capacity on these chairs are 250 lbs.